Just when the experts thought kids couldn’t cram a single second more of electronics time into their days comes a study that shows, not only that they can, but that they have. According to research the Kaiser Family Foundation released today, children ages 8 through 18 are spending seven hours and 38 minutes a day in front of various electronic devices – everything from televisions to gaming systems to smart phones. That’s a dramatic increase from six hours, 21 minutes the foundation found when it last looked at the issue in 2004. As if 53 hours a week tethered to a device isn’t enough, it gets worse. Due to devices that can multitask and kids who are growing up learning how, overall “media consumption” has increased from 8:33 a day in 2004 to 10:45 today.That’s 75.25 hours a week, folks – almost two full-time jobs. Over my dead body, Dr. Rich. The guys are just beginning their journey into electronics land. Much to their shame and humiliation, they don’t have TVs in their rooms or Nintendo DSs. Neither do they have their own phones. 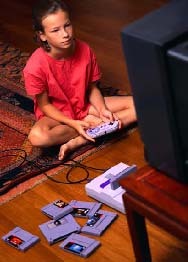 We started last year with computer games – not online – and advanced to the Wii this Christmas. Big Guy also goes online now, on a computer with parental controls that rival the security of Fort Knox. Norton’s filters were merely a starting point for me. And, yes, all the policing gets tiresome. Guys, it’s time to turn off the Wii. Guys, it’s just a game. Stop fighting over it or the Wii will take a time out. And it did for 24 hours, resting high on a shelf Big Guy can’t even reach with a stool after he threatened to free it. And, yes, I have to work to convince them to do the things they did pre-Wii. Like run around outside or play Thomas and Batman. They can be led to it. It’s just not their first thought anymore. Luckily, they still like soccer, baseball and basketball enough that they’d pick a physical game over a virtual one any day. I do it because the numbers scare me. Obesity. “Adult” diabetes showing up in children. True, electronics aren’t totally to blame for that – the garbage we eat has a lot to do with it, too. But common sense tells you that a kid who’s glued to a screen simply isn’t as active as kids were a generation ago. Not that kids a generation, or even two, ago were all fitl either. Part of the reason the President’s Council on Physical Fitness was created in 1954 was because children were entering first grade muscle deficient and schools weren’t offering enough physical activity to reverse the trend. That would be the same council that today says children and teens need 60 minutes of activity a day – and don’t count on that happening at school these days. I’m stumped as to how they get that if we follow Dr. Rich’s advice and just passively shrug acceptance. Last time I checked, Web surfing doesn’t burn that many calories. My kids are well into the media use years, as am I. I’d say that by all definitions, we’re heavy consumers. I’m a concerned parent, and I’m watching what we’re doing trying to maintain balance. But, I think that once again we’re seeing a lot of media hype. What I don’t see is kids who are actually using the cellphones they carry 24/7. Still, it’s a concern to figure out positive use of digital media. Perhaps you’ll join me when I start the digital use series. I’m currently reading iBrain and Born Digital, to get a better understanding of the issue before launching this discussion. There’s a lot of information out there right now, the challenge will be to see what’s relevant for our kids. We’re at the very beginning of the media use years, and I see concerns cropping up already. When the guys’ first thought is “Let’s play Mario” instead of “I want to read a book” or “I want to play outside,” I definitely start to worry about balance. Part of it is, I think, because the Wii is the easy option. You don’t have to get dressed, you don’t have to go anywhere. It’s right there at your fingertips. You bet I’ll join you when you launch your new series! Knowing you, I’m sure it will be thoughtful and thought-provoking. I’m going to check out the books you mentioned, too.